To summarize my Katz’s Deli experience, I would put it this way. Top quality pastrami, low value. As much as i love top quality experiences, deep down, I’m a sucker for value. Let me introduce you to value – Jersey style. When people talk about the best NY deli’s now existing outside of Manhattan, they usually mean Brooklyn, not Edison. Harold’s New York Deli Restaurant has been called one of New York’s best delis, even though it is in New Jersey. I first heard whispers from a friend, who, after one of our Katz’s experiences, stated that she was fed up with the high prices and mediocre value. “Harold’s is so much better value… you have to see it to believe it”. Harold’s is run by the former operator of the Claremont Diner, and the Carnegie Deli. Harold’s is his personal vision of a super diner/deli, where he has combined the menus from both establishments into one enormous restaurant. Located just off the I-95, it can be a bit tricky to get to. It took me two passes before i got it right. Attached to a hotel, I would use one word to describe Harold’s. Enormous. It’s classic Jersey Diner meets New York deli, this place has two enormous sections and the world’s largest pickle bar. You could probably seat half the city of Edison in this establishment, while the other half waited in line. I’m a little suspicious of places that call themselves the best. The boast never seems to ring true, and more often than not, it’s a testament to ego, or the past, more than it is to what’s true today. However, when 90% of the people who live in, or visit New York, say Katz’s is the best pastrami sandwich in New York, you have to take notice. New York is known for its pastrami, and to be the best in New York…well, as they like to think, it means you are the best anywhere. Katz’s Deli has been around since 1888. Located on the Lower East Side, it’s part of an interesting chain of old school, high quality establishments that dot East Houston Street – Russ & Daughters, and Yonah Shimmel’s Knish Bakery are located nearby as well. The building definitely is a distinctive landmark on the south side of E. Houston – but if you don’t notice the signage, you’ll notice the lineups out the door. Upon entering the premises, you will find very little has changed in the decor, and the menus for the past 60 years. There is typically two types of service – in theory, there is table service, but for a true Katz’s experience, take a ticket, and head to the deli counter to order your own sandwich. When you finally end up with sandwich in hand, you’ll need to pounce on one of the self serve tables that seem to free up every 20 seconds. I’m sure most of the Vancouverites (and other Western Canadians) are familiar with the Freybe brand. Freybe luncheon meats and sausages are often sold side by side with other common supermarket-grade cold cut brands such as Maple Leaf or Oscar Mayer. It costs a bit more to buy Freybe products, but I believe it is worth the premium. I have always thought that the quality of Freybe’s products as being a quite a few notches above these other brands. I also know that they use quite traditional methods to make their product. The Freybe brand is fairly ubiquitous, but I notice that most grocery stores and supermarkets sell a tiny subset of their entire line. If all you have seen of Freybe is Black Forest Ham, Honey Ham, Hungarian Salami and the other common sandwich cuts, then you owe it to yourself to visit this Outlet store to see how extensive their offerings truly are. I happen to live fairly close by so this store is on my regular grocery route. Located on the far west end of 10th Avenue towards the entrance of the UBC campus, Pane e Formaggio has been around since the start of this decade and has carved a niche as a popular Saturday breakfast/brunch spot for the residents of West Point Grey. Despite the narrow, bowling alley-like layout, the bright airiness of the space and the fine touches like the dark wooden flooring, high ceilings, and European-inspired tables and chairs, makes this a very inviting and comfortable place to spend your weekend mornings. It’s usually pretty tough getting one of the available tables however, so take-out is also available. Sandwiches are a bit of an enigma for me. Growing up, unlike most kids, I rarely got sandwiches for lunch. Instead, i got this hodgepodge of foods that made me stand out from the rest of the crowd. Not exactly a good thing when you’re 8. I wanted sandwiches. I wanted to be like the other kids. Fast forward a few years – I had developed a better understanding of barter, and had gotten plenty of exposure to sandwiches. I realized I didn’t really like them. Peanut butter and jelly. Salami. Some unrecognizable meat called Bologna. Dry, icky bread. Tasteless spread. I guess I would stick to my stinky, garlic-loaded leftovers after all. It took me a long time to appreciate that sandwiches could be so much more than the bread-meat-veg combos of my youth. I came to appreciate fresh bread, freshly roasted meats, with a well-made spread, some veg, all stacked in the proper proportion. Bread didn’t have to come in white or whole wheat, there was an entire spectrum of tasty choices. I got to experience some great sandwiches, but came to realize that they were generally few and far between. While they aren’t perfect, in Calgary, my favorite place is Rustic Sourdough Bakery. 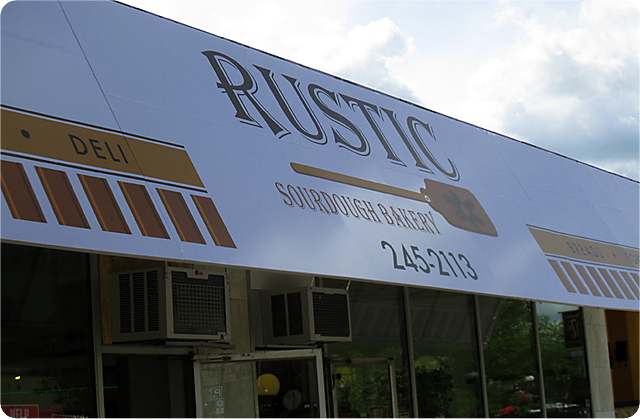 Rustic Sourdough Bakery is a European Deli and Bakery located at the outer edge of 17th Avenue. Fairly nondescript, one could pass by daily, and still not notice the awning in the sea of color and neon that populate the strip. Inside, things are divided up into two sections – a bakery side that produces fantastic bread, pastries, and other delights, and a deli, that offers up a large selection of cheese and meats. Im not 100% sure how Rustic Sourdough Bakery started in the sandwich business, but it seems like a very natural combination. 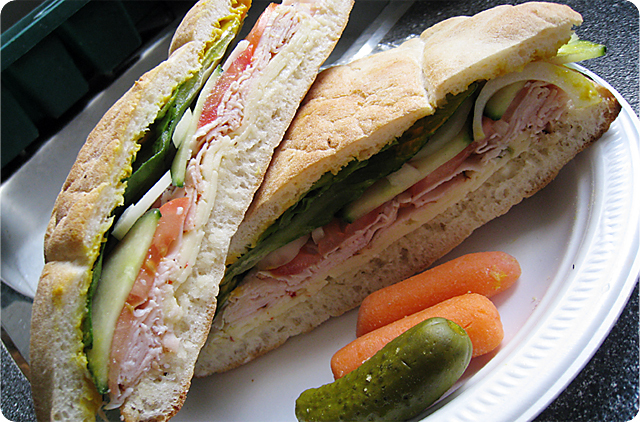 Fresh bread, freshly sliced meats, add some veg and spreads, and you have the makings of a great sandwich. For $6.00, you choose your bread from a wide variety of options. You can choose from most of the meats available, excluding some of the high end cuts like prosciutto, and choose your cheese from a wide selection as well. Pretty much any combination is available. They add your choices of veggies, condiments, and pack it all up for you. For an additional couple bucks, you can get one of three homemade daily soups. A steal of a price. At the Rustic Sourdough Bakery, the sandwiches are really good. My only complaint is really no complaint at all – just that i would like there to be fresh roasted chicken, roast beef, or other meats instead of all deli meats. I like the variety, and generally prefer a little more “substance” to my sandwiches. But that aside, the veg is fresh, the bread is fantastic (i choose the fresh “pita” option, that has structure, yet is light and soft). The cheeses and meats, of course are fantastic. And the sandwich is so large, i generally order one and eat only half and the soup for lunch. I save the other half for another day. The soups are really good as well. Homemade, they often run out, or are down to the least popular one half way through lunch service. 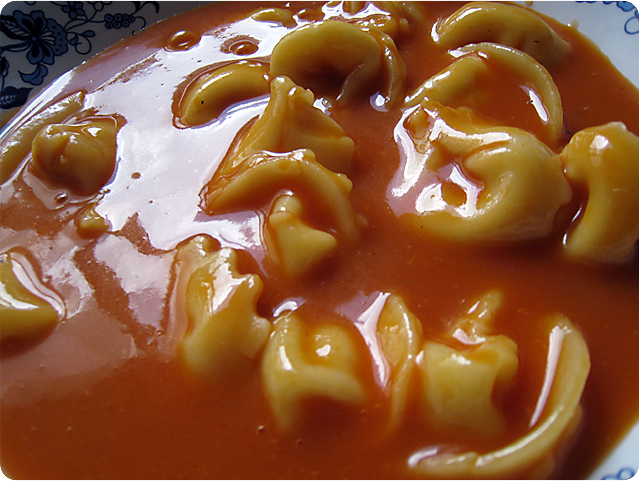 They are hot, and full of flavour, and there is always enough soup diversity that you never really get bored. Rustic Sourdough Bakery is one of those places that is busy enough – and I thought twice about writing about. To be honest, I didn’t really want to add to my already long wait for a sandwich when im in that part of town. But the cat is out of the bag now. If you’re looking for a sandwich, and price, taste, quantity and value all matter, this is the place. They make a great sandwich. Picking up a pastry from the bakery never hurts either. It really makes for an affordable, quality, tasty lunch. And compared to the sandwiches of my childhood, it is a welcome thing indeed. Especially when i don’t need to trade my home cooked meals for them anymore! While traveling around Southern Africa, things like meat were often in short supply. After all, animals that are generally food inefficient, from a food mass consumed to food mass produced ratio, are a luxury in many of the impoverished areas. I, being an unapologetic carnivore, would have a tough time without a daily dose of protein. Thankfully, I had stocked up on a great selection of biltong before leaving SA – marinated, air dried strips of meat that came from a variety of animals – kudu, springbok, oryx, beef, ostrich, and other exotic animals. 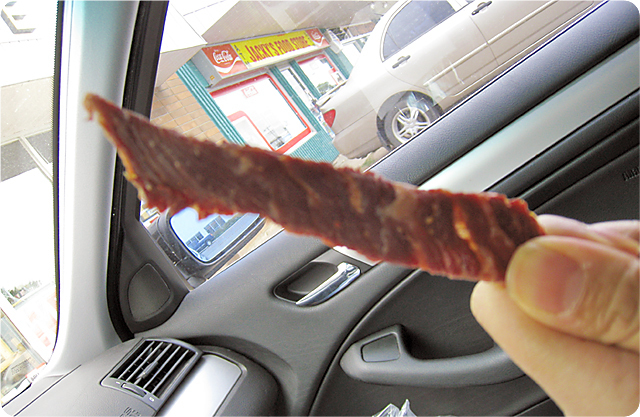 Unlike jerky, biltong is cured in vinegar, seasoned, and air dried. Many people who aren’t familiar with it are a bit taken a back at first, but it really grows on you. After leaving South Africa, I had particular cravings for several charcuterie items – predominantly chillibites, and biltong. Lucky for me, my best friend noticed a South African deli called Betsy’s Boerewors had opened up on Calgary Trail, and quickly investigated. Sure enough, they had all of our favorites, though with an Alberta twist – their products are mostly beef. 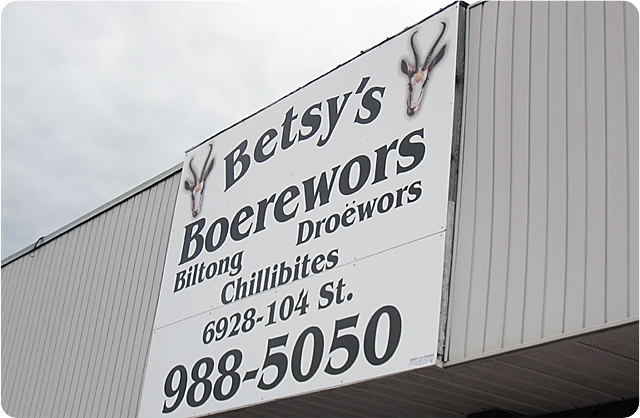 Betsy’s Boerewors are a family-run South African deli, and based on the number of ex-pat South African’s who shop there, they are either the best game in town, or the only game in town. They are very friendly, with samples of all their products to try. Very proud of their product and their heritage, they carry all your standard South African deli items – from boerewors and droewors, to biltong, chillibites, and pies. Boerwors are essentially fresh sausage. Their boerewors are fresh minced meat, well-seasoned, and loaded with a good amount of fat. Their garlic wors are even better – big garlic flavour. Both the droewors, which are cured and dried sausage sticks, and the aforementioned biltong are loaded with coriander flavour. However, the Chillibites are my favorites. Sticks of fatty, chilli seasoned beef that have been air dried – essentially edge strips of well marbled biltong that have been dried into the best pure beef version of a hot rod you’ve ever had. There is melt in your mouth striations of beef fat that attack your taste buds with bursts of beef essence, while your jaw gets a serious workout from the tough, with the grain beef cut, and some acidity and spice from the vinegar and chilli. These are one of the best snacks you can possibly have – no additives, great flavour, and preserved for easy consumption. Not that they last long. In parts around the world, they use biltong and chillibites for teething children. An expensive hobby to develop young for sure! Other than charcuterie type items, they also serve a variety of pies, and accompaniments. 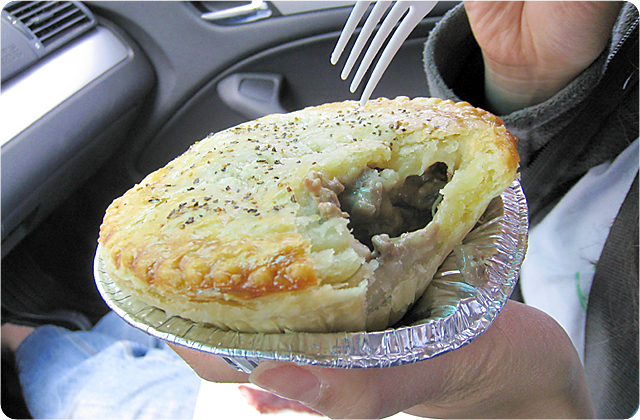 Im not 100% sure if it is the British influence in Southern Africa, but many countries all serve versions of meat pie. Likely originally to disguise meat that was slightly off, staples like peppered steak, chicken and mushroom pies, curry chicken, and cornish pasties were commonly available, and generally quite excellent. The pies at Betsy’s are even better – as they use top quality ingredients, and they come in a sizeable portion for $4 – $4.50. These sizeable morsels are especially good right out of the oven, so keep your eyes open. I’m not sure things like biltong and chillibites are for everyone. Definitely quite firm (though Biltong comes in moist, semi dry, and dry versions), the vinegary taste is definitely slightly different from the jerkys and other preserved meats we have here in North America. But I love it, and find them quite addictive. Most people I have introduced them to feel the same way. If you’re feeling a bit adventurous, stop in, try a sample or two, and be prepared for a new flavour experience.